I delight in everything about this season, and even though it’s a cliche, I still get a warm rush when Starbuck’s brings out the pumpkin lattes. But I think everyone can agree that while their coffee is pretty fantastic, their baked stuff has taken a nosedive in recent years. There was a time when I was happy to splurge on maple oat nut scones and pumpkin breads, but not anymore. Now I grab my coffee solo, because I know I’ve got an even better treat waiting for me at home. The base of this ‘bread’ is a rich buttery cake made with part whole wheat flour and studded with dried cranberries and white chocolate chips. 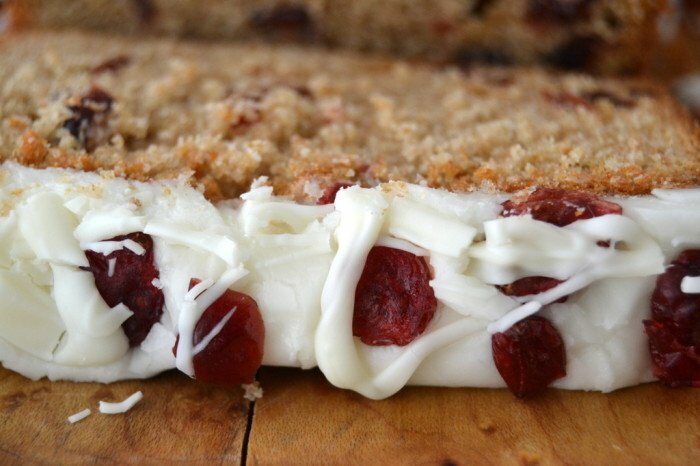 The thick vanilla frosting is covered with more cranberries, and then the whole thing is drizzled with white chocolate. It’s fun, festive, and way better than the dried out squares in the case. Part of the appeal of the cranberry bliss franchise is that gorgeous top. It just screams holiday! TIP: White chocolate can be difficult to melt. Adding a teaspoon of vegetable oil to the chocolate before melting can help. Turn the batter into a greased standard (81/2 x 4 1/2) loaf pan. I like to line it with a sheet of parchment paper to make it easy to remove the cake after baking. Bake for 55 minutes to an hour until a toothpick inserted in the center comes out without wet batter clinging to it. 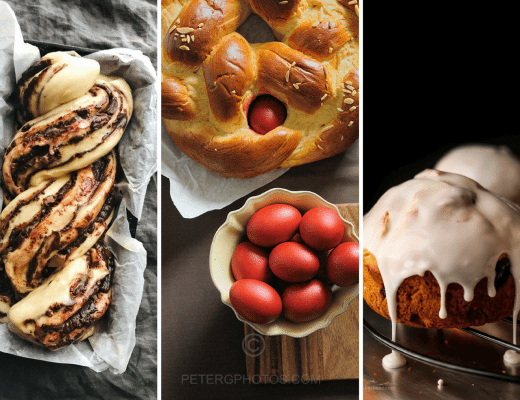 Don't over bake, check it early. 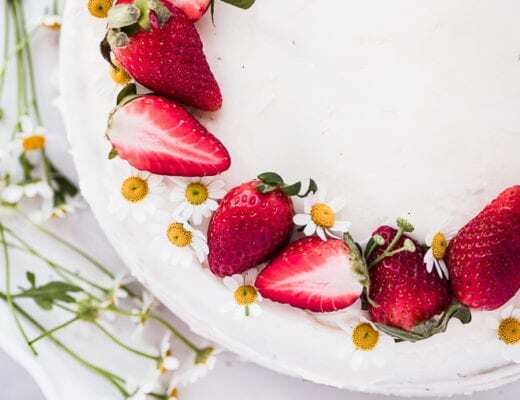 Let the cake cool before you frost it. 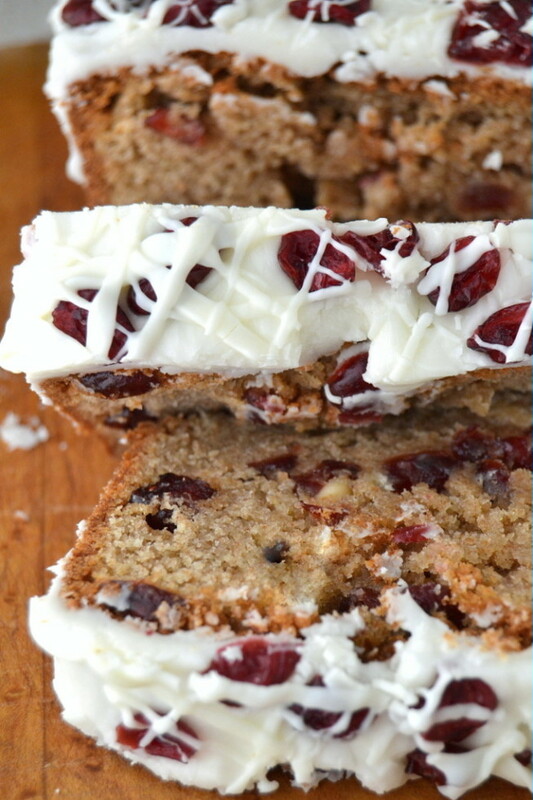 Don’t forget to pin this amazing Cranberry Bliss Bread! I haven’t tried this as muffins, so I can’t say for sure Geneine, but I’d probably go for 350F. I would like to know if this bread can be made with rregular flour and fresh cranberries? I think that would be good, but I haven’t tried so I can’t say for sure. The flour substitution shouldn’t be a problem at all, but not sure what the fresh cranberries will do to the cake, worth a try though! Re-made one but the outside was overdone to get the inside done. Made it one more time this morning…perfect! Ovens are often way off in temperature, Tammara, is it possible yours is calibrated too high? Looks wonderful, and will make later today…. but I wonder if you’ve ever tried adding pecans? Would it change the baking, etc? It sounds like a wonderful addition to me. Perhaps I’ll try one loaf with and one without. I haven’t added pecans, but you could certainly do that, and it wouldn’t change the recipe baking time. wanna make the cranberry bread. do not want to buy whole wheat flour, nor ever use it in my recipies. can i make this with just ap white? it really looks delicious. thanks. Yes, it will work fine with white flour, no need to get special flour for this. My daughter-in-law has an egg allergy. Do you think I could substitute 2 med. bananas instead of eggs. It’s worth a try, I haven’t experimented with egg substitutes in this recipe, so I can’t say for sure. Just found this Amazing recipe. I LOVE CRANBERRIES . Can I use all purpose flour instead of white and wheat flour? Yes, you sure can Lana, hope you love it! In England we don’t use cups or “sticks” as you probably know. whilst I can get around most of the receipt can you tell me how I measure the butter please. I have no idea what a stick is and short of melting butter into a cup and then letting it harden, I have no idea! That would be 113 grams Jeanette. Does this freeze well? I’m thinking of making this to give as Christmas gifts this year. Do you think I could make the loaf, freeze it, and then thaw it shortly before giving and do the frosting, drizzle, etc. then? I think most quick breads freeze well, so if you double wrap it and get it pretty airtight, it should be fine. Can you use reg milk instead of buttermilk ? That should be fine, Jean. You can also make your own ‘buttermilk’ by adding a little lemon juice or vinegar to regular milk. For every cup of milk I add a tablespoon of acidic lemon or vinegar. Aha, take that Starbucks! You’re coffee always made my stomach quesy anyway and you’re food is way to expensive. Though I will admit, their cheese, greens and tomato sandwiches (especially the one with feta) I do like. But again, so expensive! Do you have any diy’s for their sandwiches?? I haven’t done a copy cat sandwich, that will have to be next! Made this for Christmas Eve and it was amazing! The only caveat I would have is that people need to use clear Vanilla extract; I used the kind from Mexico and while it tasted phenomenal, it discolored the frosting! Ack! My husband and I baked this bread together. Was easy. Smelled delightful while baking. Expectations were high. Let it cool and drizzled all the dreamy white chocolate over it. Got our hot tea ready for our much anticipated “first piece”. It was just “okay”. Couldn’t put our finger on it until the second piece. It was dry!! I didn’t even notice during prep that there is no oil in this bread. Did oil, of some kind, get left out of the recipe accidentally? If not, what can we do to remedy this? We really want to try this again! Help!! Hi Marsha and Glen! 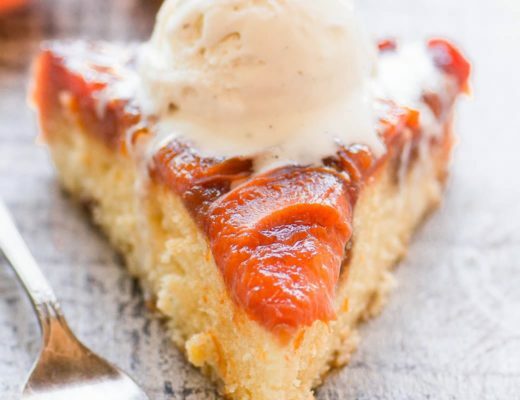 This recipe uses butter, not oil, and should have a nice pound cake type texture. Is it possible you left out the butter? Another possible reason for the dryness might be that your oven runs hot, and the bread was accidentally over-cooked. If you want to try this with oil instead of butter, you would use about 20% less oil, so a little bit less than 1/2 cup. Hope this helps! I cannot wait to try this recipe! I was just wondering, would it work if I used a mini loaf pan and decreased the cooking time? I’m hosting a cookie exchange this weekend and would like to give these as little gifts to my guests! Sure, that would be fine. I think the rule of thumb is to reduce the oven temp by 25 degrees, and bake for about 25 minutes, but I would do a test loaf to be sure, Hannah, since they’re going to be gifts. Could I use all white flour? I hate to buy a bag of wheat, for just this recipe! Has anyone tried it that way? Yes absolutely Renee, it will work fine. I just baked this amazing cranberry bread! I doubled the recipe it is so easy and it came out great! I love it I also used fresh and dry cranberries. It came out yummy. When I first looked that the Cranberry bliss Bread picture I thought this will take some time to bake but after reading your recipe it seems so easy to make ! I will surely be trying this very soon! Thanks for the great recipe! Delicious recipe!!! I had fresh cranberries that I needed to use up, and the bread turned out the ideal combo of sweet and tart. I wasn’t wondering if I could just use regular flour instead of whole wheat flour because I have a gluten allergy? Yes, that should be fine, Courtney. I bet you could use a good gluten free flour blend as well. I just made these today and I used GF flour. I also made them in a tiny loaf mold from Demarle. They turned out perfect at 25 minutes, the flour was not an issue. Great to know, thanks Joan! 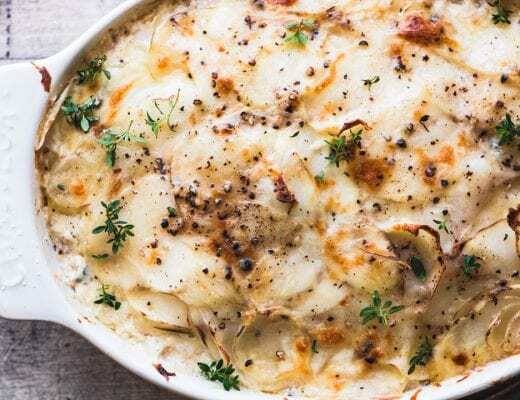 Have this in the oven right now .Cannot wait to taste it,looks yummy. Oh my heavens. This looks amazing. I am totally making this over the weekend. I can’t wait to try it. I believe I used standard sweetened dried cranberries, Diane, but I’m sure either would work. I think in general most dried cranberries are sweetened because the fruit is so tart. I just had my first Pumpkin Spice Latte today and can’t wait for the rest of the Autumn bakes to hit the shelves. 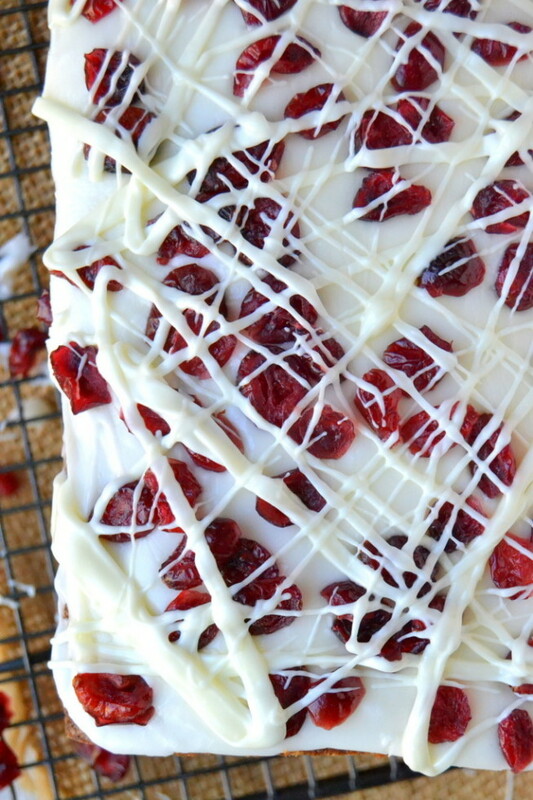 I’ve never seen Cranberry Bliss Bars in the Starbucks here in the UK but after seeing this I’m dying to try your version. It certainly looks like bliss indeed! :) Thanks Laura – I haven’t had my first Pumpkin Spice Latte, I guess I better get with the program! Thanks for stopping by. These look really yummy! Have you ever tried making this in mini loaf pans to give as gifts? I’m thinking a full size pan might be too much. Think it would still work but maybe just cook for less time? I would love to make these in mini pans too. I’ve put other bread recipes in mini pans and I usually just check them around 25 minutes or so. I think this would work with this recipe. I’m sure it would, it’s only that baking time that can screw things up. This would make great gifts in mini tins! I made this bread today and it has great flavor, however, all of my vanilla chips and cranberries sank to the bottom of the bread. When I tried to remove the loaf from the pan, the entire bottom stayed in the pan! Any idea what I did wrong or what I should do differently? I followed the recipe without any modifications. Hmm, my batter was pretty thick, and I didn’t have that problem, was your batter on the thin side? That could be a measurement problem. The whole wheat flour tends to make a thicker batter, too, so if you used all white flour, that could be it. Sometimes recipes say to mix the add-ins with the flour first, and that can help keep them suspended. Hope this helps! These look delicious! I’ve been looking for a recipe to make for Christmas gifts, definitely trying this recipe! Question, what size loaf pan did you use? Thanks!! Great question, I just updated the recipe to say a standard loaf pan, about 8 1/2 x 4 1/2. Good luck with it Ryann! Wow! I am SO making this bread! I can almost taste it just by looking at it…cannot wait! Thanks for the recipe, Sue! I love Cranberry Bliss anything! I have pinned this for later. Thank you. Wow…this could not be more beautiful! I love that gorgeous top! I need a slice right now! I’ve had a starbucks gift card in my wallet, for months, that I haven’t used. Funny, but I rarely go there. So, I’ve never tried any of their baked goods. I’ve seen these bars, and have been tempted. Your version is gorgeous! I’d love to have this with my own coffee, from home! Hi Sue, Just had a pumpkin latte today as a matter of fact, always signals fall. 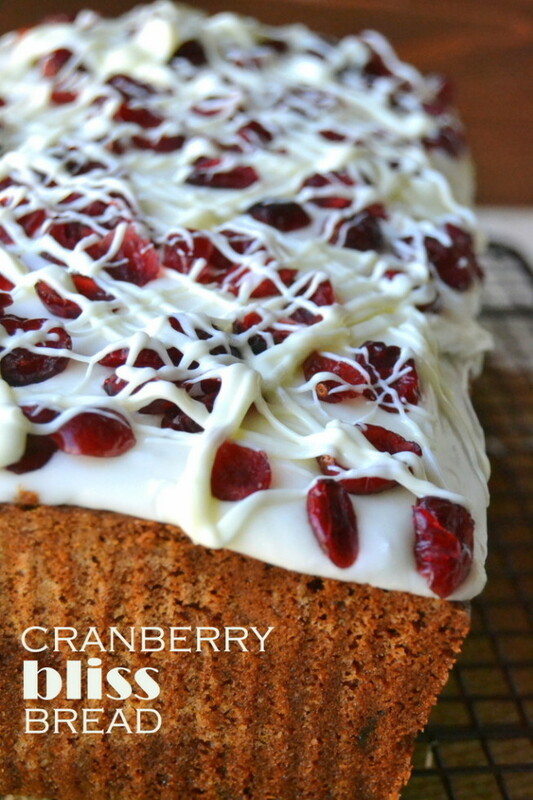 Love, love this cranberry bread. Looks gorgeous! So gorgeous, love the drizzle and cranberry topping! This looks so good. I admit I’ve heard about the Starbucks version and I did use to love those maple scones, but this looks like way better. I mean, REALLY WAY BETTER! better? I totally see it and believe it! It looks and sounds 10 times better and that is one of my favorite breads from starbucks too! I really have to bake this bread, it looks so yum. I always look at it when I go to Starbucks but I never tried it. As much as I prefer unadorned sweet breads, this is so gorgeously delicious I would love to try it! You’re right, it does scream “Holiday”. Hi Sue..I/ve made the bars but never the bread nor the cookies..everything everywhere looks terrific.. a few links don’t work but if you Google the name of the blog and the recipe..it does..(Ex..Gimme some oven)..
Wow, your bread. Just wow. I totally want this! I’ve made Cran Bliss Bars, and Cookies, and was just yesterday on a long run thinking well what else could I do with that…and voila, bread! But now I won’t make it because you beat me to it, but seriously, looks amazing! Festive indeed! I’m loving this thick white chocolate topping. YUM! These look stunning! And these are my sister’s favorite. I’m debating between sharing the recipe with her or making them for her and then winning best sister of the year award!! And yes – I completely agree with the Starbucks nosedive. They went with La Boulange and now the morsels look like pre-formed options that are high in calories and fat -with little character. The seasonal cookies are super cute, but I still never buy them. Ok – Starbucks rant over (until it comes up in conversation again)! Dear Sue, I agree; the baked goods at Starbucks is expensive and really not all that much to write home about. Homemade is the best and so much easier on the wallet.